The RAF are appealing for people to come to the funeral of a 101-year-old Dambusters engineer and his wife who have no family. 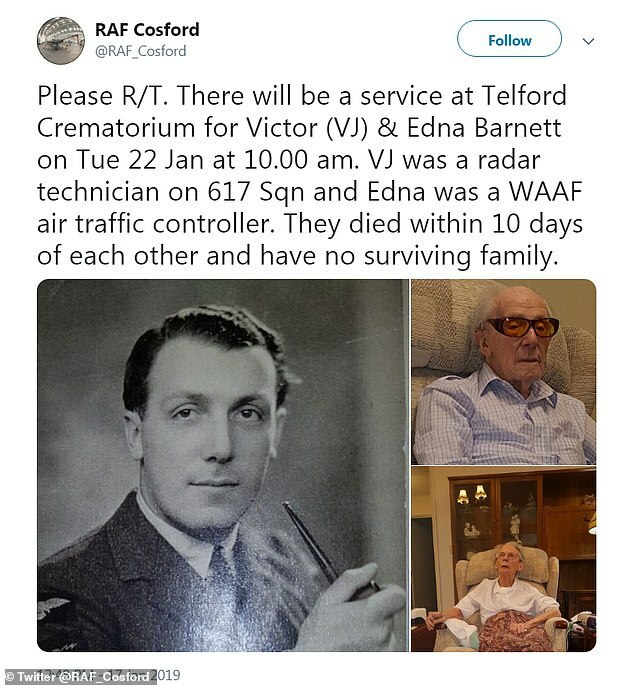 Victor and Edna Barnett, from Telford, Shropshire, met in the air force and were married for 68 years but have no children or surviving relatives. Hundreds of people on social media have now shared an appeal for guests to attend the funeral of the couple. 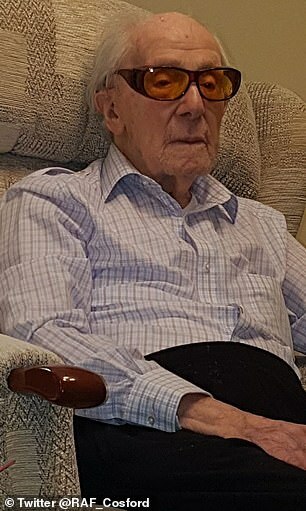 Mr Barnett joined the RAF in 1937 and worked on the first radar system that detected German planes during the Battle of Britain, according the the BBC. 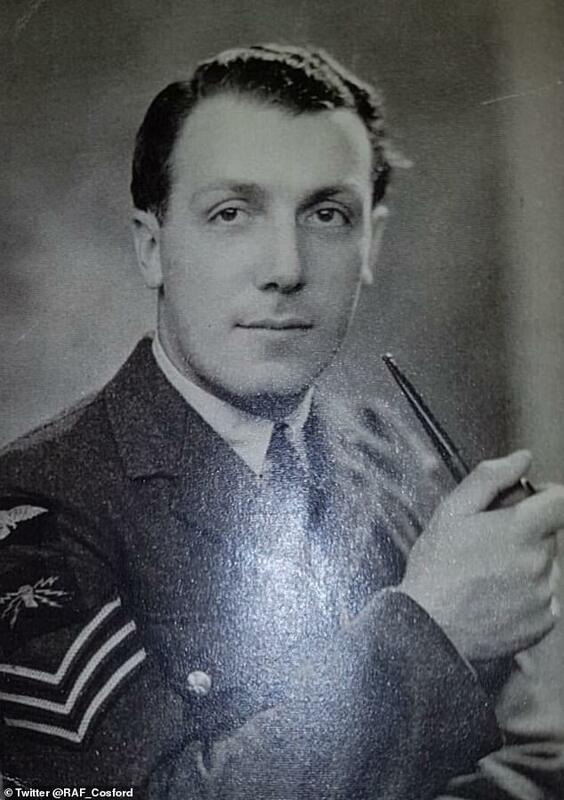 The war hero then went on to help prep Lancaster bombers for the Dambusters for the 1943 raid on German dams. He even went on to befriend ‘bouncing bomb’ inventor Barnes Wallis, according to the BBC. Mr Barnett, also known as VJ, met his wife Edna, who worked in the air traffic control for the Women’s Auxilliary Air Force, the following year. 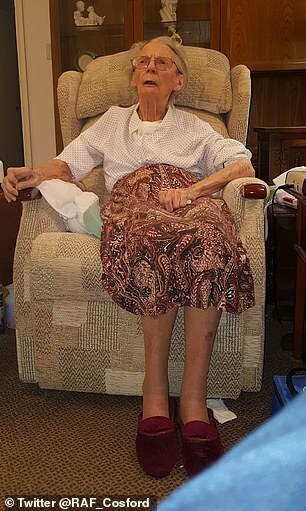 But sadly Mr Barnett died on December 21 after 68 years of marriage with his wife dying just 10 days later on New Year’s Eve. Squadron Leader Chris Wilson told the BBC: ‘The fact he was in the air force was enough for us, the fact he has done something extra special makes it all the more relevant. RAF Cosford is planning to send servicemen to bear their coffins on a funeral on Tuesday after a friend informed them of their death. RAF Cosford tweeted an appeal on Thursday. They wrote: ‘There will be a service at Telford Crematorium for Victor (VJ) & Edna Barnett on Tue 22 Jan at 10.00 am. The tweet has already received an overwhelming response from users , with some offering to attend with cadets and others planning to travel across the country. One user wrote: ‘Awaiting approval off to attend with some of our cadets from 83 St Georges Sqn AT’. 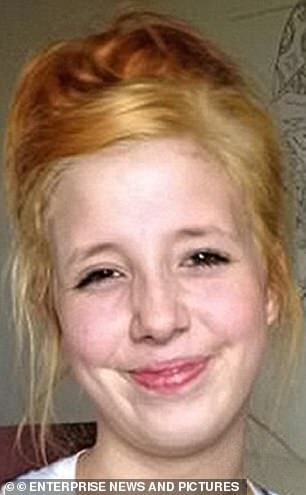 Another said: ‘I live in Telford and will make sure I am there to pay my condolences.. I am also sharing this on social media in Telford area’. One said: ‘I live in Telford and I will attend. This couple deserve respect and recognition for all their work. Bless them both’. One wrote: ‘Trying to sort train tickets now from London’.